Vienna traffic. 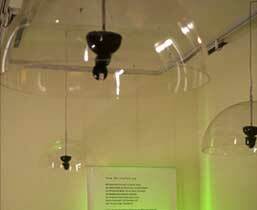 Sound installation at the Museum of Ethnology, Vienna. Vienna traffic was commissioned by the Museum of Ethnology in Vienna and presented there as part of the exhibition nichts tun between June and November 2000. For this composition I focused on the acoustic potential of Vienna's public transportation system. As a source material I used bus, subway and tram environments as well as specific sounds like bells and electronic signals, loudspeaker announcements, opening and closing doors, arriving and departing trains, and the hypnotizing rhythms of subway escalators. Many thanks to architect Christian Prasser, and the whole team at the Institute of Ethnology, Vienna.